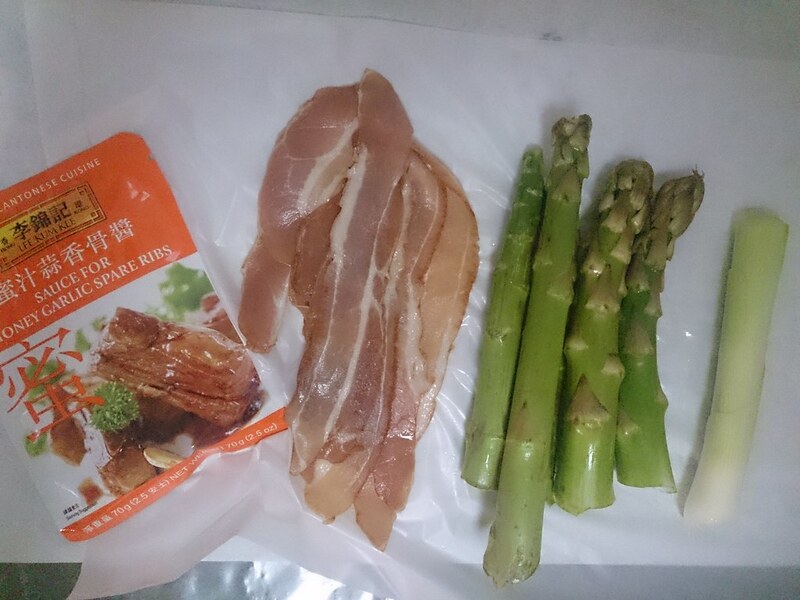 Following my first recipe post on Minestrone Soup, I shall now share with you the second dish which I had made concurrently - Asparagus Wrapped with Bacon is done using Lee Kum Kee's Sauce for Honey Garlic Spare Ribs. Inspired by my previous tasting at Moosehead Kitchen, honey dates wrapped in bacon, I decided to do my rendition of this dish. 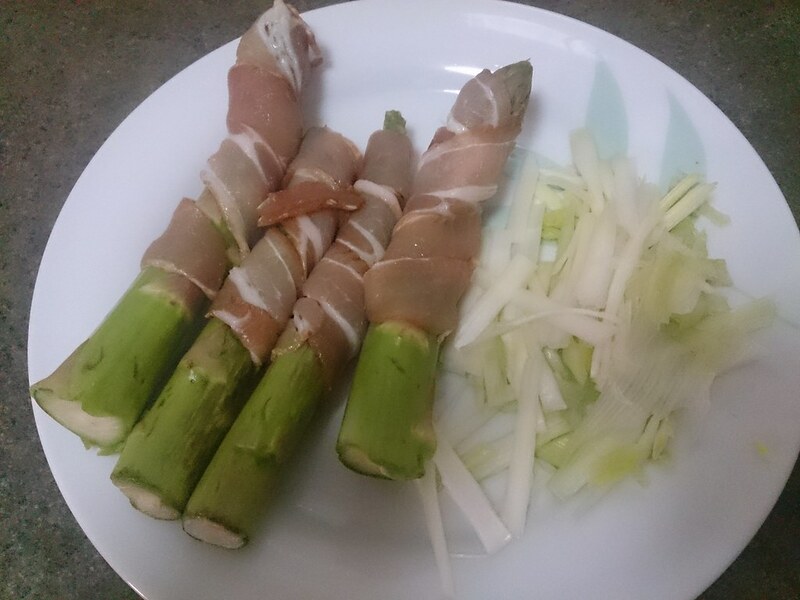 The three main ingredients are asparagus, bacon and leeks. I feel bacon is quite a versatile ingredient. It is like a condiment that gives the dish a salty, smoky characteristic. I use leeks a lot in my everyday dishes as they have a long shelf life and pair well with meat or fish. After my non stick pan was heated, i placed them neatly side by side to brown the bacon. I turned them regularly to prevent them from being too burnt on one side. Once evenly brown, I placed them on an aluminium foil ( when I'm too lazy to wash the oven pan). I then glazed the bacon streaks with Lee Kum Kee's Sauce for Honey Garlic Spare Ribs. I only use about 2 tablespoons of it and kept the remaining in a container. They are to be roasted for 15 minutes, 250 degree Celsius. Oven is my best friend in the kitchen. It allows me to prepare other dishes or back to my chores while it works its magic. While waiting for the asparagus to be done, I stir fried some shredded leeks with the oil rendered from the bacons. When my asparagus was done, I topped it with the shredded leeks. I then dressed it up with my very own lemon mayonnaise to cut the fats. You may want to use lemon juice only. I adore savoury-sweet taste! I find that the garlic-ky sweetness of this sauce coupled really well with the salty, smoky bacons. The lemony mayonnaise also lends some creaminess and tanginess to the overall taste. 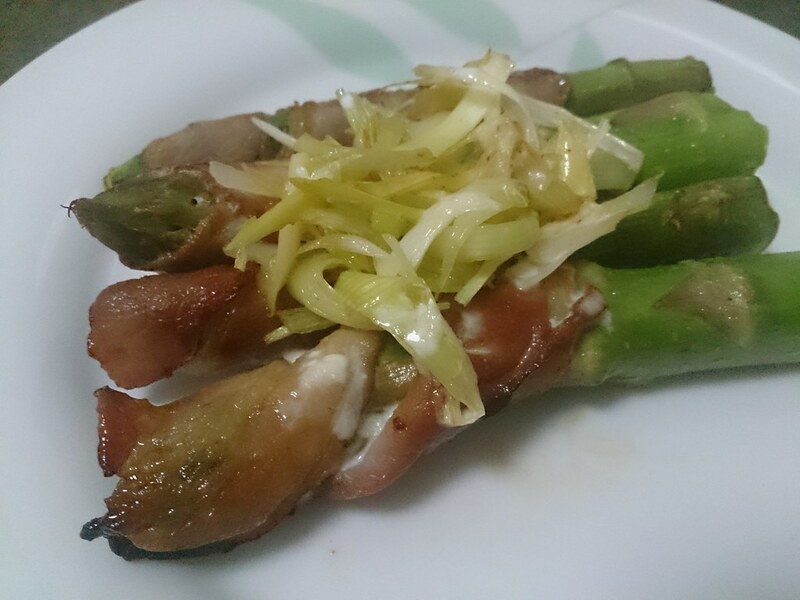 Dish: Asparagus wrapped with bacon, glazed with Honey Garlic Sauce, spiked with shredded leek. Drizzled with lemon mayonnaise. 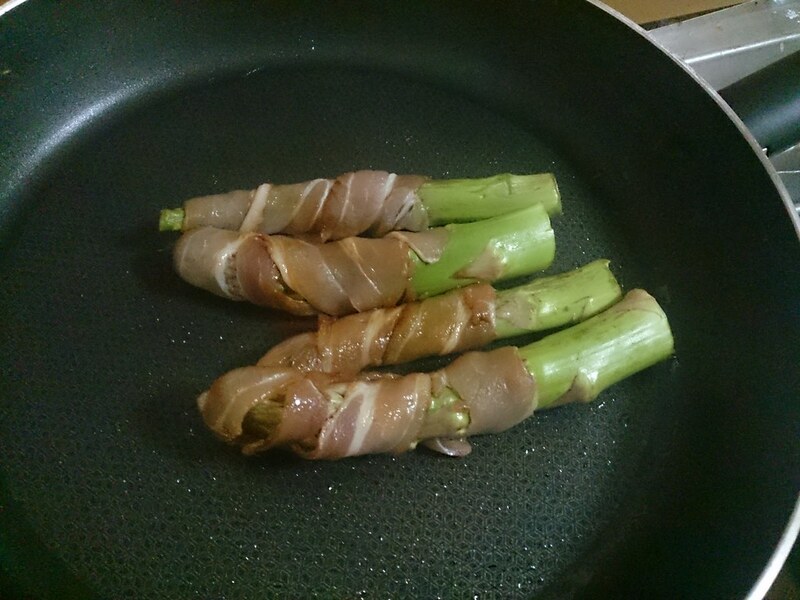 1)Wrap 3/4 the asparagus with the bacon. As bacon can be quite salty and flavourful, wrap half the green is enough. 2) Grease the non-stick pan thinly and place it over medium heat. 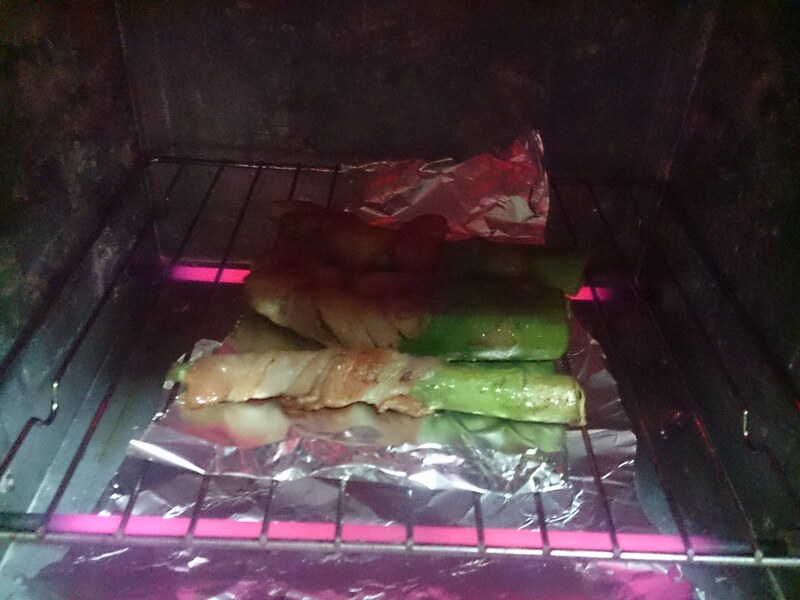 3) Once heated, lay the wrapped asparagus neatly side by side one another. 4) Grill to slight brown. 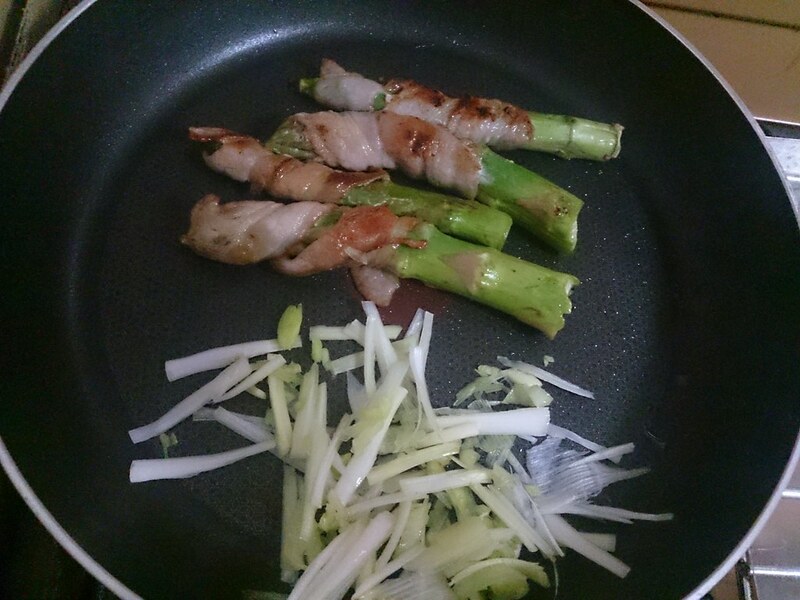 5) Slice the leeks and stir fry it in the non stick pan using the oil rendered from the bacon. 6) Once brown, roast them in the oven for 15 minutes , 200 degrees celsius. To be safe, check it after 10 minutes, to make sure that the temperature of your oven is right for the bacon. Too high a heat may cause the bacon to char before the asparagus gets cooked. 7) Lastly, dress it up with lemon mayonnaise and its done!